The Webster University Sports Research Conference was held Saturday, Sept. 8. The conference, directed by Allison Levin, faculty member in both the School of Communications and the George Herbert Walker School of Business & Technology, and the Webster Sports Media and Analytics Club, invited research presentations on all facets of sports. 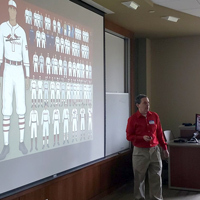 The presentations included projects from two Webster students who also presented this summer at a national meeting of the Society for American Baseball Research (SABR). Jacob Claspille, a recent sports communication program graduate, presented "Leading Off: Does Speed Still Matter." Alexis LaMarsh, a junior sports communication major, presented "Fan Views: Perceived Attractiveness of Professional Baseball Players on Success." Awards, sponsored by the Bob Broeg chapter of SABR, were presented to top presentations. Levin earned honorable mention for "Striking the Motherload: The Influence of the Cardinals Way on Hall of Fame Inductees." Scott Jensen, professor of Sports Communication and Speech Communication Studies, won the Jim Rygelski Award for the top presentation, "Winning and Modernization: Implications of the 'New' Chicago Cubs on Fandom, Tradition, and the Cubs as 'Promised Land.'" The Sports Media and Analytics Club, sponsored by Levin, is planning several other community events throughout the year.